Until the Cold War, the United States maintained a small military force both on land and at sea. A small navy for coastal defense and a token army to keep the natives in line by and large summed up the US military during peacetime. Thus, when the call to arms went forth, it took time for the US military to mobilize itself in sufficient force. It could take even longer to get those men and supplies into battle. Such was the case during World War I. When the United States joined the Entente in 1917, it needed soldiers and supplies in large numbers quickly. Though mustering men proved easy enough, gathering supplies turned out to be more problematic. Complicating matters was a lack of transport ships to get the men and equipment to Europe. 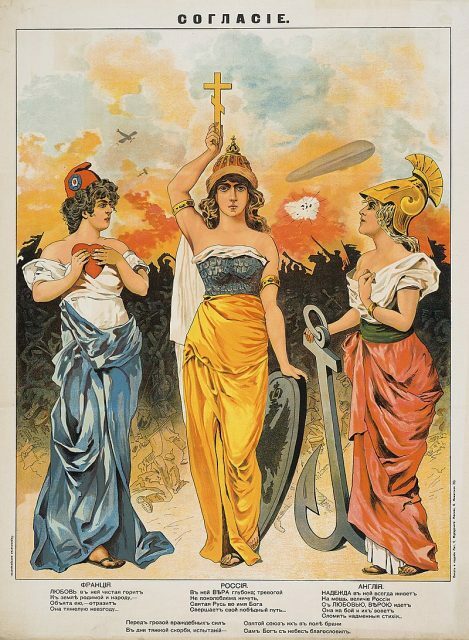 A 1914 Russian poster in which the upper inscription reads “agreement”. The uncertain Britannia (right) and Marianne (left) look to the determined Mother Russia (centre) to lead them in the coming war. 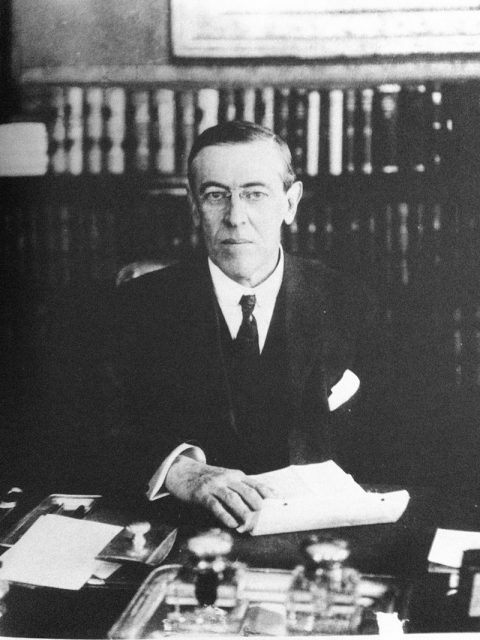 To get the soldiers and their supplies overseas, President Woodrow Wilson approved a bold and ambitious maritime buildup. The plan called for one thousand steamships, each three hundred feet in length, in eighteen months. Eighty-seven shipyards were tasked with building the massive fleet. To speed up the building process and save steel for combat arms production, the vessels would be built of wood. Construction of the massive transport fleet saw little oversight, and by October of 1918 only 134 of the ships were finished. Less than 300 remained half built, with the rest not even started. Barely a month later, the war ended. Of the 1,000 vessels, 731 were bought and paid for, 130 finished, 98 delivered, and 76 could carry cargo. None had crossed the Atlantic. Aerial photograph 1936. 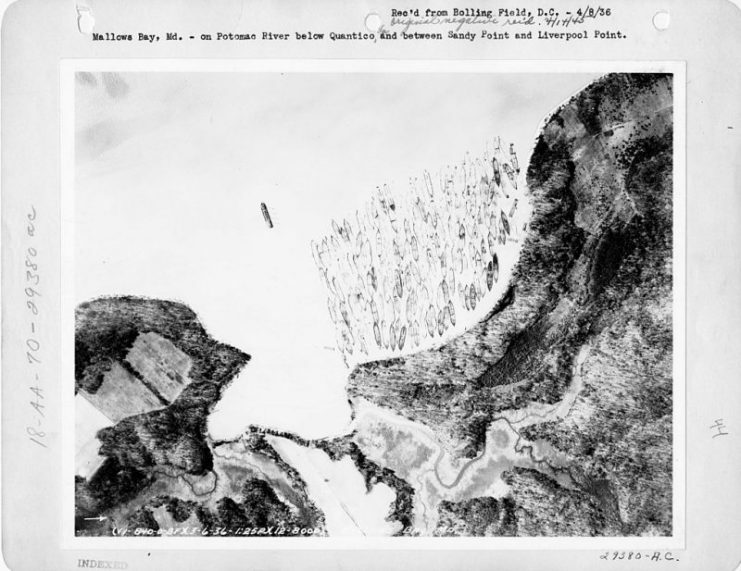 Mallows Bay on Potomac River below Quantico and between Sandy Point and Liverpool Point. Like any other well funded contract, the work continued. By the next year 264 useless wooden hulks of scrap had been delivered to the US government for a war already over and a military already reduced to peacetime sizes. The government struggled to find a use for the ships while they sat and rotted. Though they could perhaps have been useful during the war, the wooden steamships now loomed as nothing but an obsolete pile of white elephants. Steel, cheaper and easier to produce and use than ever, supplanted wood for good as a major shipbuilding material. The transition from coal to diesel rendered the vessels even more useless. As a final nail in their oversized coffin, corners had been cut during construction, leading to shoddy work and poor craftsmanship. With nearly three hundred leaky hunks of wood wasting away, the government tried several times to unload their white elephants. In 1920 Congress put the ships on sale at discount. They were purchased in 1922 by Western Marine & Salvage Company for a quarter of a million dollars. The company planned to tow the vessels, strip them of anything resembling value, and burn the remainder to the waterline. 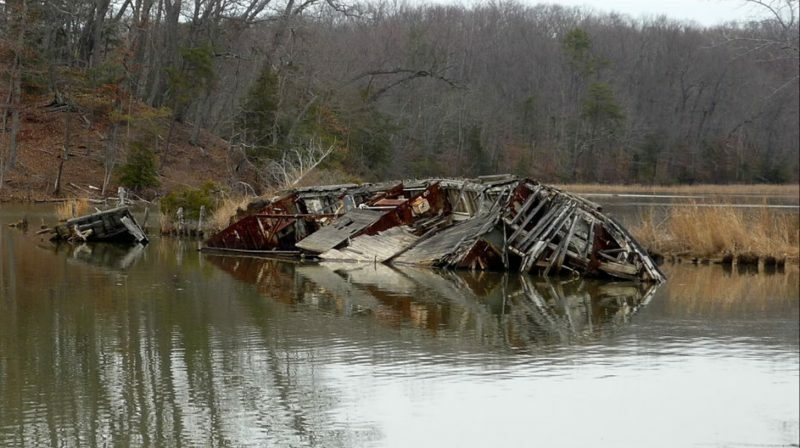 Protests and the Great Depression left 170 wooden ships near Widewater, Virginia, along the Potomac River. The only other salvage effort occurred during World War II. Bethlehem Steel attempted to salvage whatever iron could be found amongst the wrecks. Though scrap iron values soared during the war, the salvage effort proved too expensive, so it was abandoned. 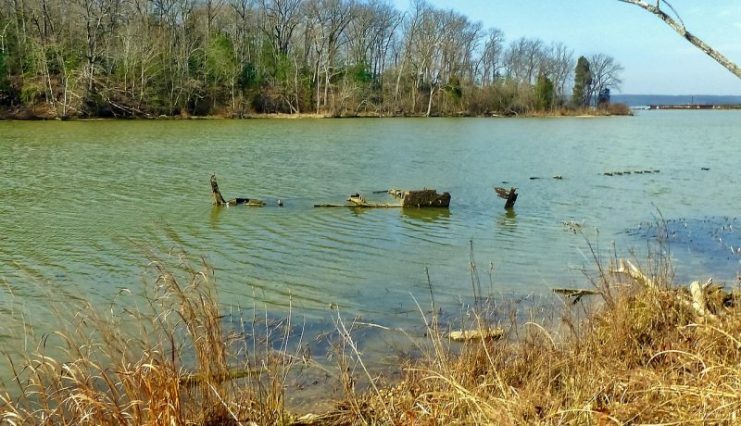 The vessels were left in a spot called Mallows Bay, where they and a slew of other wrecks are laid to rot and rust. Eighty-eight of the old wooden ships remain. Efforts are underway to turn the graveyard of ships into a national marine sanctuary. 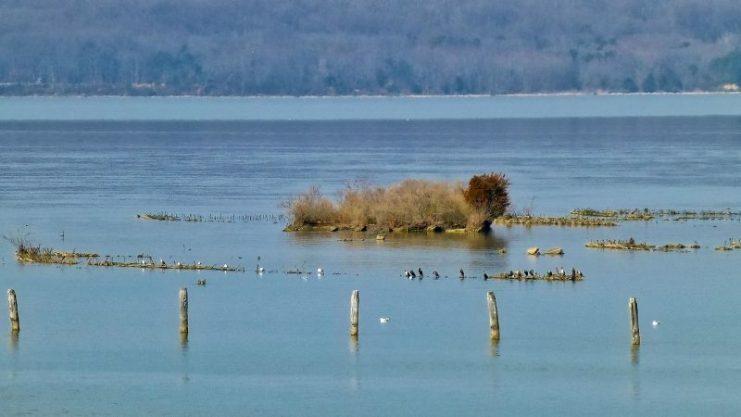 In the meantime, Mallows Bay and the wooden ships remain as a relic of bygone eras, bygone ships, and of a rapid maritime buildup operation gone horribly awry. Fortunately, when the next world war arose, America’s maritime construction proved far more equal to the task.